Posted on June 18, 2018 by admin in - WOW! 28 3/4 x 28 in. One of the most important postwar artists, Ed Ruscha came into prominence during the 1960s pop art movement. First recognized for his associations to graphic design and commercial art, Ruscha became admired for his mediations on word and image, where a word literally becomes an object. This weeks WORK OF THE WEEK – WOW!!! 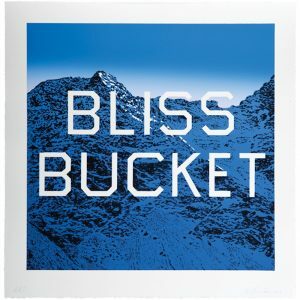 is Bliss Bucket, a snowcapped mountain scene, bearing the words, with his self invented font. Since the late 1990s the mountain has become one of Ruscha’s most consistent motifs. He produces classic mountains, taken either from images of the Himalayas or from his own imagination. Actually, the words aren’t so much written on top of the depiction of the mountain as inscribed within the work, the crisp lettering clear, clean and as virgin as the snow itself. Each word has the momentous authority of an alp; they shout, as though to start an avalanche. Ruscha would stumble upon these words, considering them to be his own version of Duchampian readymades. When the words began to invade his mountain paintings the result was boldly striking and beautifully absurd. The mountains receded to the background while statements such as BLISS BUCKET threw themselves at the front of the plane with big, look-at-me lettering making it impossible not to enjoy these clever combinations. Inspired by the text based works of fellow Pop artists Jasper Johns and Robert Rauschenberg, Ruscha pursued a lifelong artistic exploration into the formal elements of printed text and its fluid relationship to the visual image. By culling words, images and phrases that have been imprinted in his memory and that are found in mass media (print culture, advertising billboards, etc. ), his work often serves as a visual encyclopedia of American culture. These symbols of consumer culture are as deeply rooted in the American vernacular as the mountains Ruscha paints. His clever word associations pop off brightly colored canvases daring the viewer to react. For Ruscha words are also images, in that they provoke the imagination of the viewer. Ruscha’a mounting paintings speak to how commercialism and consumerism are slowly encroaching on the natural world. 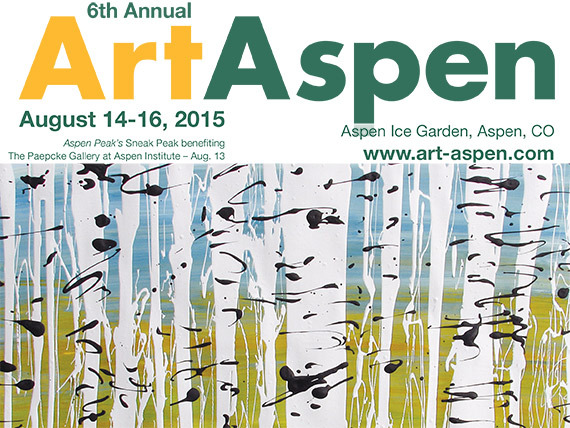 This work is about before and after and the passage of time. The presence of commercialism and consumerism is unnatural and harsh, yet they accurately reflect the effect that our consumer driven culture has on the dwindling unspoiled natural world. Mass media, billboards, and megastores are empires in their own right and have left an indelible imprint on our world. The unblemished views of these pristine monuments are slowly being encroached upon by sprawling suburban strip malls and colossal super stores. “The buildings violate the beauty of these mountains,” The abstraction with which he renders is classic Ruscha – he doesn’t give us too much but just enough to trigger our imaginations and associations. The subtlety of this rendering allows this painting to leave a far more substantial imprint on the viewer and make a much stronger statement on the condition of our world. Posted on May 21, 2018 by admin in - WOW! Posted on January 2, 2018 by admin in - WOW! Pencil signed and annotated B.A.T. 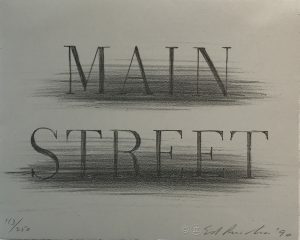 Language has often be inserted into visual art, yet no other artist uses it the way Ed Ruscha (roo-SHAY) does. His works are not pictures of words but words treated as visual compositions. “I like the idea of a word becoming a picture, almost leaving its body, then coming back and becoming a word again,” he once said. Through his textual works, the artist has made his mark in a universe somewhere between Pop and Conceptual art. Over his six-decade-long career, critics have always had trouble classifying Ruscha because his oeuvre doesn’t fall into any predisposed category. As with Andy Warhol and Roy Lichtenstein, his East Coast counterparts, Ed Ruscha’s artistic training in Los Angeles was rooted in commercial art. Ruscha’s style and subject matter, however, and the deadpan humor with which he executed them truly set him apart. This week’s Work of the Week! WOW! is Ruscha’s Stranger, dating from 1983. It is a prime example of the techniques and style of the artist, and is part of a series of artworks of words over sunsets and night skies (which many refer to as landscapes) that Rsucha started producing in the early 80’s. This particular example is the B.A.T. (bon à tirer, which translates as “good to pull”). The B.A.T. is the final trial proof, the one that the artist has approved, telling the printer that this is the way he wants the edition to look. Bon à tirer means ready for press. The edition size of this work is extremely small of only 7 pieces produced. To have the B.A.T. is very rare. 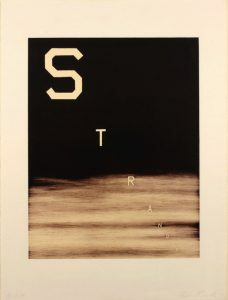 Set against the backdrop of a dark night, the word “stranger” is depicted in an all-caps lettering of Ed Ruscha’s own invention named ”Boy Scout Utility Modern.” The font is a boldface print type with squared-off curves. Inspired by the truncated edges of the Hollywood sign, the typeface is transformed as letters take the place of characters on a stage, hovering in middle distance with a three-dimensionality all their own. The result? Images that land somewhere between clarity and mystery, symbol and signifier, art and poetry. In using “stranger” as a visual, with a newly created typeface, the artist glorified it as an object rather than a mere piece of text, thus dignifying “stranger” as an object, bestowed with iconic status. The influence of Hollywood and advertising are ever-present in the work of this LA artist and Stranger is no exception. This is highlighted in the way Ruscha placed his subject, covering the overall space of the plane. His bold “stranger” floats on a vast background, and mimics the opening screen of movies or fleeting glimpses of roadside billboards that must catch an audience’s attention in one compelling instant. The cinematic perspective of “Stranger” has a dramatic, raked perspective which can be traced to classic Hollywood black-and-white films. This unique diagonal positioning of the letters is disruptive and encourages the viewer to look at something ordinary in a different light. The words Ruscha chooses for his creations have a multiplicity of meaning, which push the viewer to consider each connotation of the word. What is the first meaning that comes to mind when faced with the word “stranger?” It can be read as either noun or adjective. This ambiguity adds to the power of the work. Ruscha has always insisted that he never intends to instruct his audience, there is no hidden agenda, leaving each of us free to interpret the word. Ruscha has said that “Art has to be something that makes you scratch your head,” but it doesn’t need to take itself too seriously either. His works are as playful as they are thought provoking. According to the artist, there is a simple rule for distinguishing between bad and good art. Bad art makes you say ‘Wow! Huh?’ Good art makes you say ‘Huh? Wow!’ It’s a good rule. ‘Huh? Wow!’ is most revealing when considered in terms of Ruscha’s own work. When observing his work in that context, the ‘Huh? Wow!” is what makes his art so enduringly great. Posted on March 22, 2016 by admin in - WOW! Ed Ruscha is a well-known American artist who achieved recognition for artworks incorporating words and phrases, all influenced by the deadpan irreverence of the Pop Art movement. Indeed his textual art can be linked with the Pop Art movement but also with the Beat Generation as well. During the Cold War era, the rise of commercial advertising was a dominant force in American life. Consequently, the increasing importance of graphic design, the popularity of Hollywood and American cinema as well as the lights and the landscapes of the West Coast, provided the backdrop against which Ruscha developed his highly original iconography. Since the early sixties, Ed Ruscha has wittily explored language by channeling words and the act of communication to represent American culture. Language, in particular the written word, has pervaded the visual arts, but no other artist has the command over words as Ruscha. His works are not to be understood as pictures of words, but instead words treated as visual constructs. His idea plays into the very essence of Pop Art. 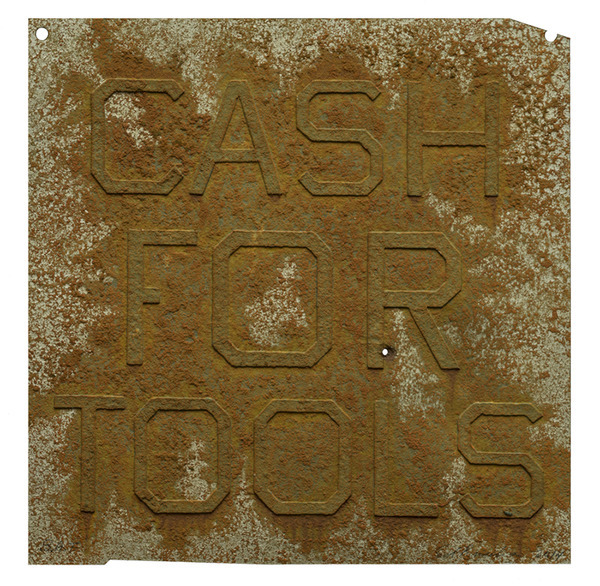 Cash For Tools 2 is part of the Rusty Signs, series in which Ruscha uses words, that he considers as “neglected and forgotten signs from neglected and forgotten landscapes”. These Rusty Signs are reproduced in uncanny detail that blurs the line between the fictitious and the real. This artwork, as well as the whole series, is further expression of a consistent theme that runs throughout his work: the passage of time. We are confronted with the physical effect of time upon them, a blunt reminder of its inescapability, even on steel. Ruscha has chosen to produce multiple variations of these signs, giving the impression that they have been weathered by time in varying ways, as if they came from different locations or were subjected to a different set of circumstances. For example there are two versions of Cash For Tools and Cash For Tools 2 is more ruined and consumed than Cash For Tools 1. Some have gunshots and some are missing sections, while others appear to have acquired thick layers of rust and grime. In this way, each piece of the series seems to contain an independent story, their histories having literally formed their present state. 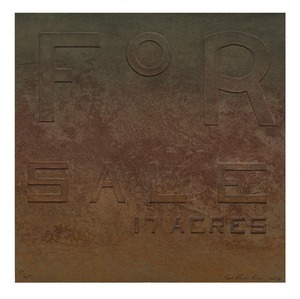 The Rusty Signs series also marks a transformation of some of Ruscha’s aesthetic concerns; having painted and photographed signs and signage throughout his career, works such as Cash For Tools 2 signify the first time in which he is not merely representing the image of the sign, but actually recreating the sign itself. We no longer see a fictionalized representation but we actually see the sign itself, and its physicality is a part of its essence. 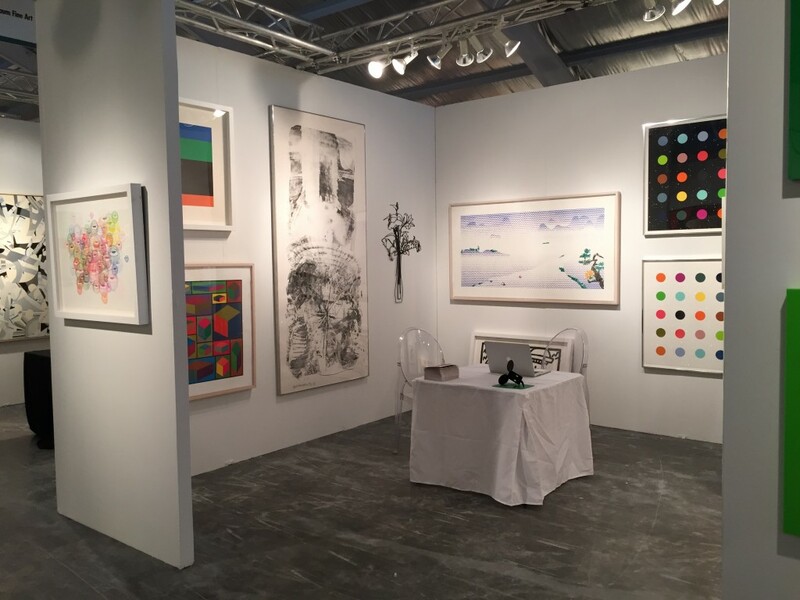 At the same time, having been removed from context, they still share the sense of disconnection that permeates in many of his depictions of signs. Ruscha asks us to consider these components of visual culture as independent objects, as if their introduction into the world was not merely an accident or result of inevitable forces, but an act of creation, a work of art. Posted on January 6, 2015 by admin in - WOW! Since the early sixties, Ruscha has wittily explored language by channeling words and the act of communication to represent west coast American culture. Language, in particular the written word, has pervaded the visual arts, but no other artist has the command over words as Ruscha. His works are not to be understood as pictures of words, but instead words treated as visual constructs. His idea plays into the very essence of Pop Art. 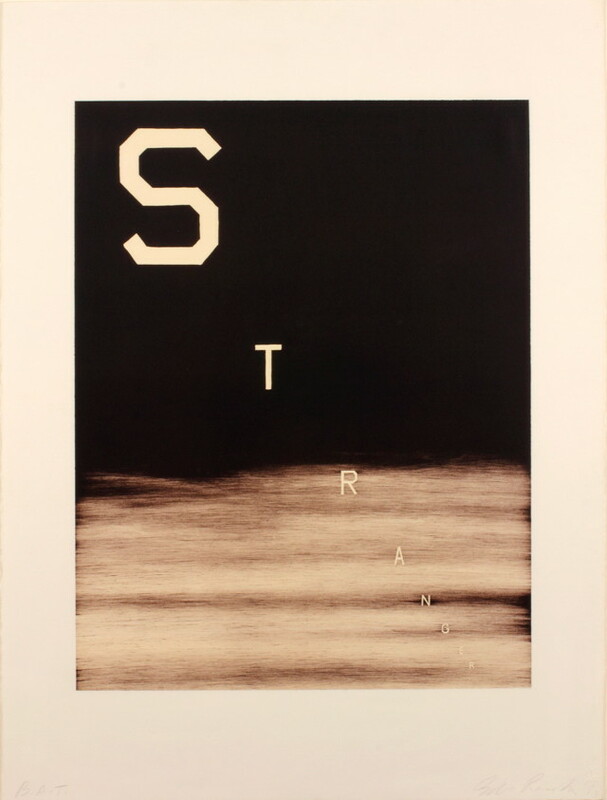 Ruscha offers the capacity for multiple meanings of words, as seen in Stranger. Stranger can be a understood as a comparison of more or less than, or rather something or someone unknown. There is no definitive right answer, the meaning is based upon viewer discretion. The descending style in which he displays the word, both iconic and playful, elicits a similar ambiguity. Edward Ruscha has remained an important figure in American art since the early 1960s when his artwork first came to the fore as part of the West Coast Pop Art movement. Since that time, he has continued to develop his signature style, which combines words and images on the same visual field. By doing so, visual and verbal means of communication coexist and create a sense of friction. The words conjure mental images that do not necessarily describe what the eye actually sees in the painting. A major retrospective of Ruscha’s career opened at the Hirshhorn Museum and Sculpture Garden in Washington, D.C. in June 2000 and traveled to the Museum of Contemporary Art, Chicago, The Miami Art Museum, and the Modern Art Museum of Ft. Worth, TX. In 2001 Ruscha was elected to The American Academy of Arts and Letters as a member of the Department of Art. Ruscha’s work has been exhibited internationally for three decades and is represented in major museum collections. Among his other public commissions are a mural commissioned for the Miami-Dade Public Library, Miami, Florida (1985 and 1989); and for the Great Hall of the Denver Central Library, Colorado (1994-95). 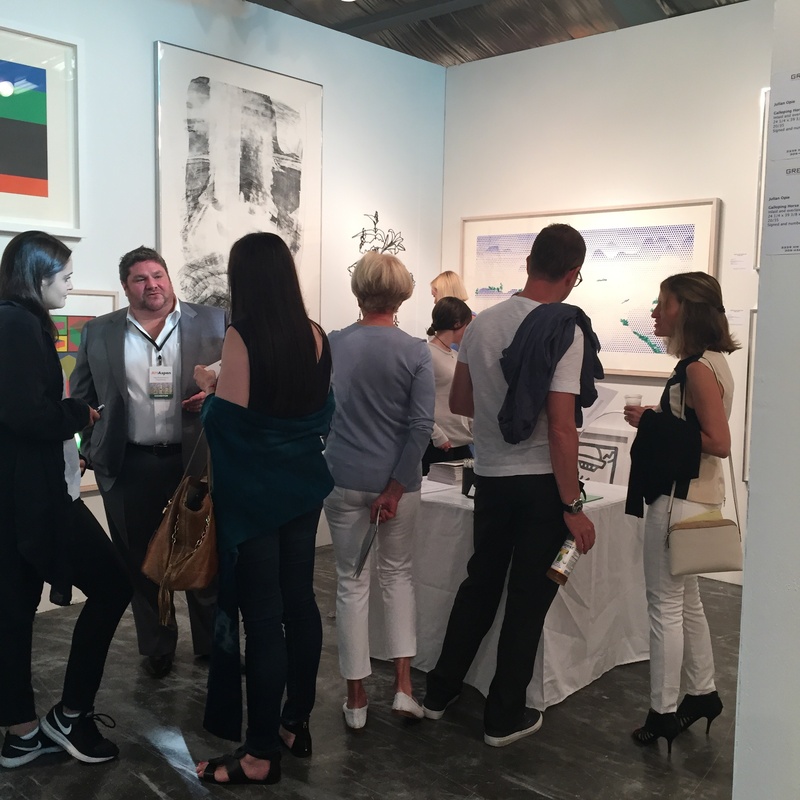 Ruscha is represented in Los Angeles by Gagosian Gallery and in New York by Leo Castelli Gallery. In 2004, The Whitney Museum of American Art exhibited an Ed Ruscha drawing retrospective, “Cotton Puffs, Q-tips®, Smoke and Mirrors: The Drawings of Ed Ruscha,”.